It’s that time of year again. Christmas decorations are going up around the house, stores are playing Christmas music around the clock, and families are planning the holiday gatherings. If you’ve opted for an artificial tree, it’s just not the same without the fresh pine scent. 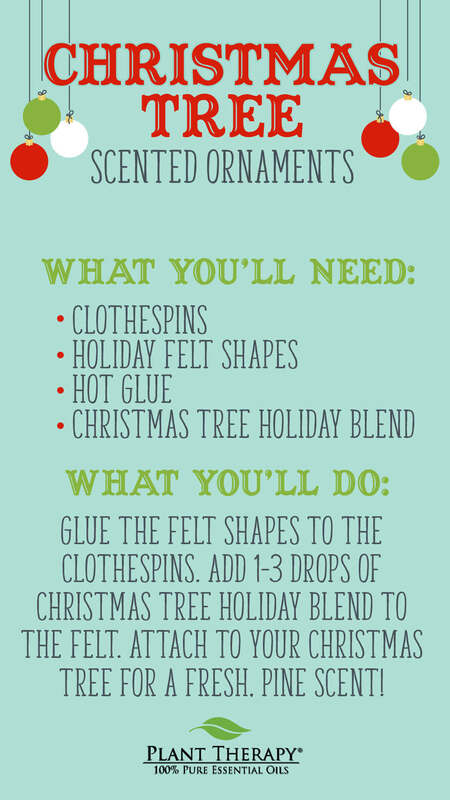 Use these fun DIY scented ornaments to bring the fresh Christmas Tree aroma to your holiday decor. Glue the felt shapes to the clothespins. Add 1-3 drops of Christmas Tree Holiday Blend to the felt. Attach to your Christmas tree for a fresh, pine scent! Great idea to make fake trees smell good! Thanks! My daughters and I made these using the Holly Berries blend for coworkers and teachers. They went over very well. Just in time, the artificial tree is up and ready to be decorated! This is such a cute ideaa for passive diffusion! Good idea for cars too. What a great gift idea. I’m thinking it would be great to make in different scents for the car too. My kids LOVE essential oils AND crafts, so we will definitely be making several of these. Thanks for all you do, Plant Therapy! These are adorable! Perfect crafting activity to do with my kids! Thanks plant therapy!! Thanks for the great craft idea! My kids will have fun making these this year. Thanks PT! This is such a cute idea!! I can’t wait to try this! This would be so fun to make with family! This is a great idea! So simple and can make a great gifts!!! What a great idea!! I will be doing this on my Christmas tree this year!!! You guys come up with the cutest ideas! Very simple and fun! Ohh love this!! We are for sure making these!! Thanks PT! What a great idea… and one not just to be used at Christmas time, but for all year round, with different scents and shapes of course. How cute! I’m going to do this tonight. Thanks! I’m definitely going to do this with my family. I was trying to figure out an ornament we could make that incorporated essential oils. Thank you! I just ordered some of this oil and i already have a few felt ornaments. I’m excited to make our tree smell real! I have a few paper and stuffed ones too. I bet this would work on those too. Merry Christmas! I can’t wait to add the scented ornaments to my tree! Another great easy project for me to use in my after school programs with kids. Projects need to be easy and able to complete within half hour. Glue sticks would be an easy substitute for the hot glue gun. Kids could take ornaments home with instructions for parents to add EO’s if they chose. Thanks, PT! Such a fun idea. I think my little would love this! Cute idea – especially for work where we can’t use a real tree. It will make an artificial tree smell nice. Such a great idea! Will do this soon since we have an are artificial tree this year. Another fun idea to add to my list of stuff I would like to do! What a neat project. I might have to purchase this one. I love this idea and have started using it since I have an artificial tree. Thanks for posting! Good stuff!! The christmas tree blend is AMAZING! Perfect thing to spruce up an artificial tree. Great idea to make good use of the Christmas oils. It’s simple so can do wtih kids. They’ll surely be in love. I love this idea! We have an artificial tree so this will help us get the tree scent. Cute and simple idea! I haven’t tried the Christmas oil blends yet but I love the fall set. Oooo! I see making homemade Christmas presents with the kids this weekend! Will be making these this weekend with the grandkids. It is cooking and crafting weekend at Nana’s and always looking for a craft that incorporates my oils. Love the ideas you all come up with. You guys have the cutest ideas ever! Loiks fun and easy enough. What other single scents might be a good substitute? Cinnamon? I am allergic to some tree EOs, including pine, so I explore cautiously. Be careful with cinnamon – a little goes a long way. It can be very irritating to the respiratory system for some folks. I personally find it quite irritating when I breathe it in. This is so cute and simple. These would be great to make passive diffusers for the car in various styles. This is such a super simple idea, but I’ve never thought of it! We also volunteer at a nursing home and have been debating craft ideas…now I’m wondering if they would enjoy something like this. I’ll need to check with the director first, but thank you for the idea! I found Christmas Tree in my stash – didn’t remember purchasing it last year – and decided to difuse it yesterday in my bedroom. I love it! I was afraid it would be too pungent for me, but it’s just clean and crisp. Ornaments are an awesome idea, especially for artificial trees. Fun Idea! And the kids can do it, too!!! Fun Idea! And the kids can do it, too! So cute! Thanks for this idea! Can’t wait to try with my kiddos! Love this! My hubby is a firefighter and refuses to have fresh Christmas tree. I’ve been diffusing Christmas Tree Holiday blend, but this will be an added bonus to get that fresh pine scent that I am really longing for. What a great diy. I just love all these neat ideas you share. This one is going be so easy but fun. Can’t wait to make some. Thank PT! You’re welcome, Tracy! So glad you love this DIY! Love the idea! I think we’ll make some as room decor too! Oh my, this will definitely be a project for me and my grand!!! She LOVES making things and is beginning to get involved in asking for her tummy oil!! Thanks for growing our knowledge base about options for oil use.